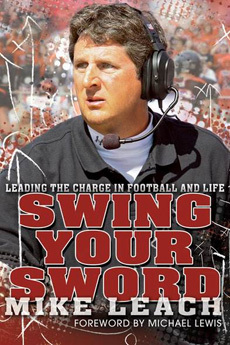 SWING YOUR SWORD is the first ever book by one of the most fascinating and successful coaches in sports today. A maverick who took an unlikely path to coaching through law school, Mike Leach talks about his unorthodox approach to coaching and the choices that have brought him success throughout his career. A lover of the game who started creating formations and drawing his own plays as a kid, Leach took his Texas Tech Red Raiders to numerous bowl games, achieving the #2 slot in national rankings and being voted 2008 Coach of the Year before being unceremoniously fired at the end of the 2009 season. The scandalous nature of his dismissal created a media frenzy and began a personal battle between Leach and his accusers that remains unresolved.